The Fantastic Fifties #1 Spring 2017 Collector's Issue - from the UK! 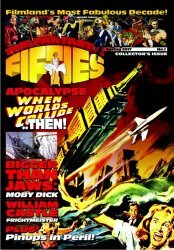 MyMovieMonsters.com > Monster Magazine Marketplace > Fantastic Fifties (UK) > The Fantastic Fifties #1 Spring 2017 Collector's Issue - from the UK! Filmland's most fabulous decade! Now from the UK comes The Fantastic Fifties, the exciting new fantasy magazine from Hemlock Publishing. This is the debut, Collector's Issue, Spring 2017. Perfect bound, full-color glossy magazine. 64 pages. Spring 2017. Hemlock Publishing. For mature readers. Collectors Note: Remaining copies are brand new and uncirculated received directly from the publisher, however, each has a slightly bent corner caused in shipping from the UK. Also want the Special Edition #1? Use the convenient Buy Both button below!